Kallan Archer is a freelance artist from South Wales. Specialising in ink and producing artist sketch cards for the Topps Trading card company, Kallan is currently producing sketch cards for licensed products such as ‘Star Wars’ and ‘The Walking Dead’. 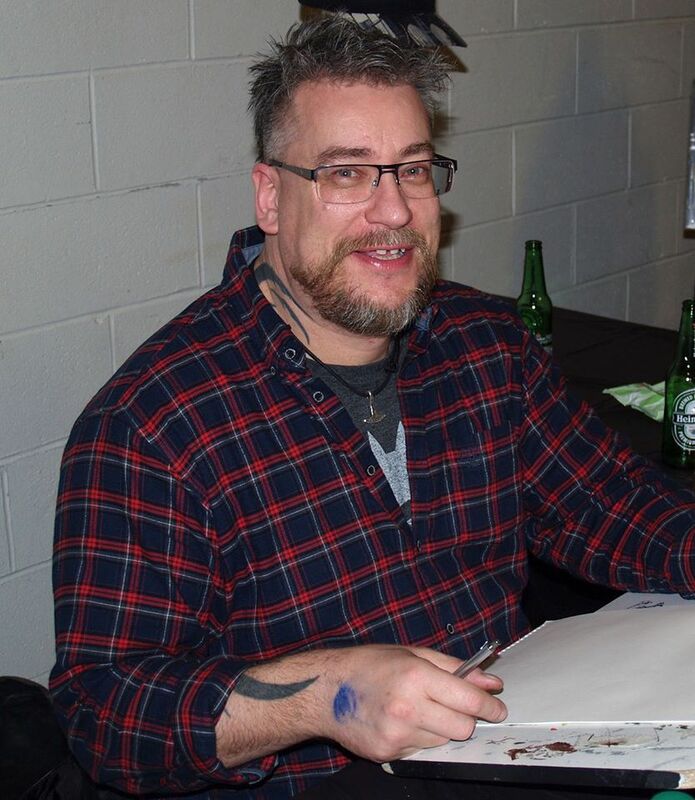 Simon Bisley has been in the business for over 20 years. His stand out work has appeared in and on such titles as 2000AD, DC and Heavy Metal, and has produced iconic pieces featuring Batman, Lobo, Slaine, Judge Dredd, ABC Warriors, Wolverine and Doom Patrol. He has also produced work for the band Danzig, and Kerrang magazine. He cites an eclectic range of classical and contemporary artists such as J. M. W. Turner, Gustav Klimt, Frank Frazetta, Bill Sienkiewicz and Richard Corben as having influenced him. Andy Chambers is a veteran writer and games designer with more than twenty five years experience. He is best known for his work in the Warhammer 40,000 universe. From 1990 to 2004 he worked at Games Workshop as lead designer for three editions of the Warhammer 40,000 miniatures game (2nd 3rd and 4th), as well as titles like Warhammer Fantasy Battle, Necromunda, Space Marine, Titan Legions, Epic 40,000, Gorkamorka and Battlefleet Gothic. Andy moved into PC gaming to work on the hit real time strategy game Starcraft 2 at >Activision Blizzard. Andy is now working as creative director for Reforged Studios and as a creative consultant for Phoenix Labs in addition to designing worlds and writing fiction for a variety of other publishers including; Black Library, Fantasy Flight Games, Hawk Wargames, Warlord Games, Dust Studios, Playmotion and Sega Interactive. Andy will be on hand with the team from Warlord Games to show off his new game Blood Red Skies, a World War 2 Fighter Combat wargame. The Etherington Brothers are back for the second year running!. They have been making all-ages comic adventures for over a decade, and are the creators of Long Gone Don, Monkey Nuts, Freaky and Fearless, Baggage and Von Doogan. They have created comics, stories and art for Star Wars, Transformers, The Phoenix, How to Train Your Dragon, The Dandy, Kung Fu Panda, Wallace & Gromit, Madagascar and James Bond. Their client list includes Disney, Dreamworks, Aardman, the BBC, and many of the world’s largest book publishers. Their books have been translated into several languages, and they have toured the world performing sold out shows on creativity and storytelling. 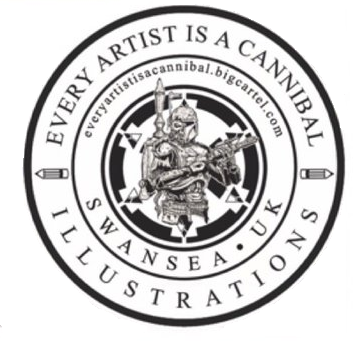 At the Swansea Comic and Gaming Convention they’ll be brnging their FULL BACK CATALOGUE, and doing FREE sketches with every book sold! Dylan Teague has been working in comics for about 20 years. 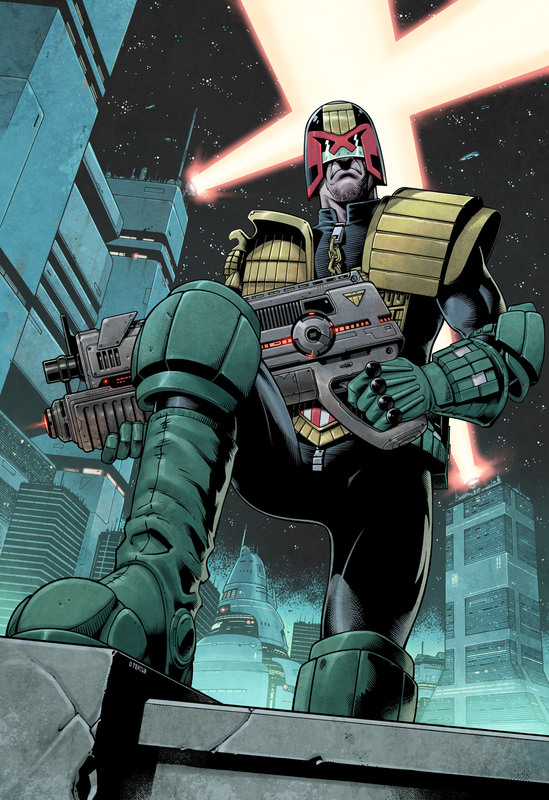 He’s done most of his work for 2000AD and Judge Dredd the Megazine. More recently he’s branched out into the French market, working on 2 graphic novels for Delcourt and one for Kennes Editions. He’s currently working on a strip for David Lloyd’s Aces Weekly amongst other things. Yve Hill of Yvil Cosplays is this year’s Cosplay guest. Originally attending conventions as her own Steampunk character, Yve decided to take her first leap into cosplay by sewing her favourite character, Princess Garnet from Final Fantasy 9. It’s popularity inspired her to create the Yvil Cosplays page. One year later and Yve is ready to show off her growing collection of handmade Cosplays which include; Mrs Stay Puft (Ghostbusters), a Grey Warden Mage (Dragon Age), and a Tech Priest (Warhammer 40k) . 3D Fantasy Art showcases the arts and crafts of Deedee Davies. She creates fantasy, horror and gothic art using 3D modelling and rendering programmes, along with a variety of geeky and alternative craft products. 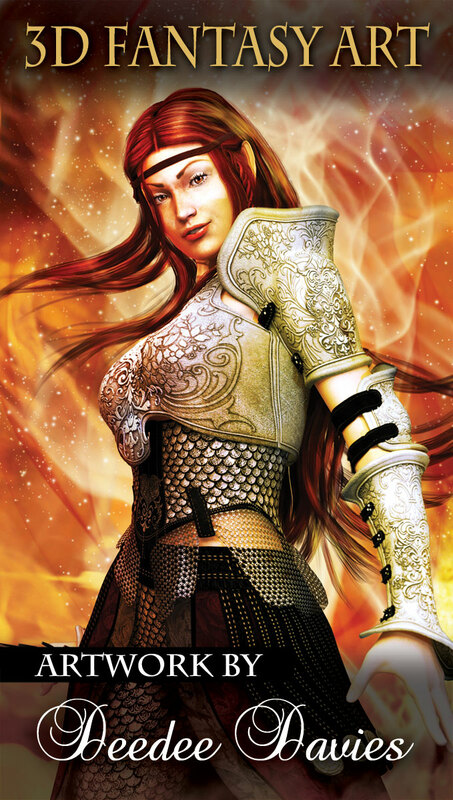 3D Fantasy Art has been in business for over 10 years and offers a range of services, from book covers and CD artwork to custom character portraits. A selection of framed and unframed prints, mugs, mousemats and postcards will be on sale at Swansea Comic and Gaming Convention 2018, along with a selection of handmade crafts. A J King is the author of The Power Vested in Me trilogy. 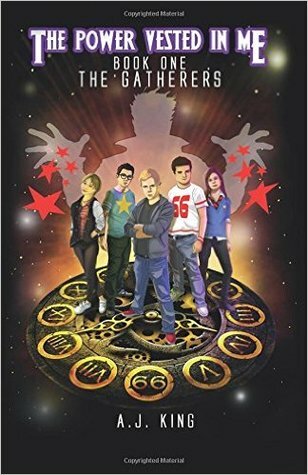 The fantasy book tells the story of 5 teenagers (the Stardust) with magical powers and their journeys firstly back in time and then through the Land of Nod to achieve a secret goal- guided by the mysterious Starkey. 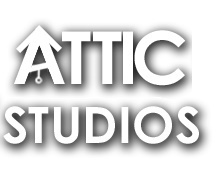 Attic Studios is the brain child of Jim Bampfield, Kris Carter and Dan Harris and is the home to Indie comic titles: Lou Scannon, Druid Investigations and Bruce Outback. Dressed to the Nines Designs provide hand forged sterling silver jewellery with a geeky twist! BethRose Jewellery are a small jewellery business specialising in geeky pieces from many different themes. They have items from Game of Thrones, Doctor Who, Harry Potter and various Anime and video games. 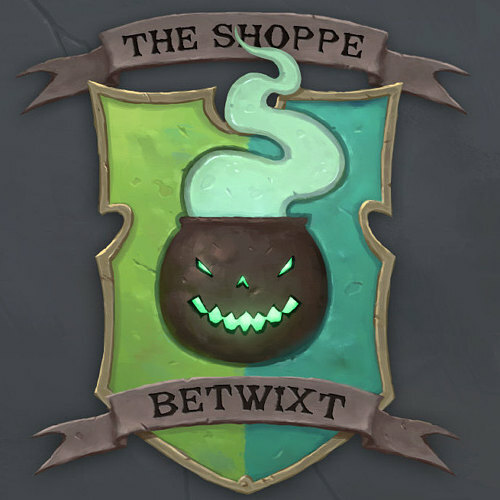 Betwixt and DoodleCurls are two animators who make weird and wonderful things, a penchant for the occult and cute. Selling art prints, zines, stickers and even wands. Bishop, Please! make geeky and fun gifts for your weird companions! With their love of pop culture, you can get niche greetings cards, badges, pins and stickers to suit every fandom! 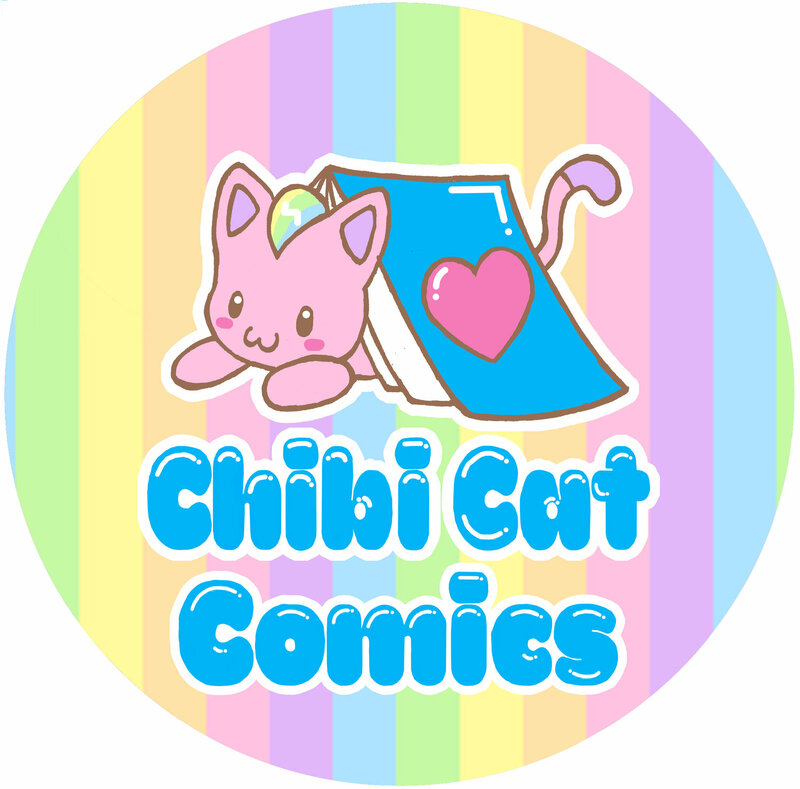 Chibi Cat Comics, located in Wales UK, is a cute comic and clothing store that sells adorable merchandise inspired by Japan! With their cheerful mascot Chibi Cat their goal is to make the world a kawaii place. They fuse Japanese pop culture with a bit of Welsh flair to create unforgettable comics , adorable plushies and dazzling clothes for everyone to love. The Collectable Toy Company is a family run business based in Cardiff. They buy and sell retro and modern collectable toys and video games, genuine lego figures and much more. Visit their stall for a massive blast of nostalgia! 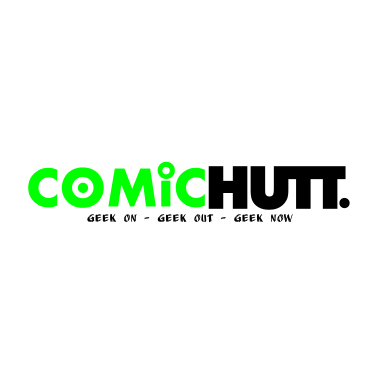 Comic Hutt are a small business based in Carmarthen, specialising in pop culture, movies, TV & gaming merchandise. They sell Funko Pop Vinyls, collectable figures, keyrings, mugs, badges, stickers, and all things geeky! 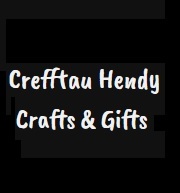 Crefftau Hendy is the home of handcrafted jewellery, cards, hair accessories and frames, many of which have a geeky nature. Items can be made to order or personalised, and they also offer a range of Welsh cards and gifts. 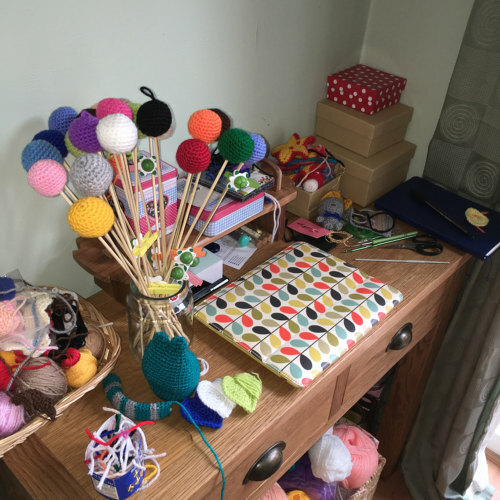 They have recently branched out to include gifts and toys to compliment the handcrafted business. Darren Doyle is a first-time independent trader who aims to bring together all of the most popular comic, film and gaming collectables. His range includes retro games; collectible figures of Game of Thrones, Marvel and DC; Pokemon, Yugioh and other manga trinkets; Mystery boxes and loads more! 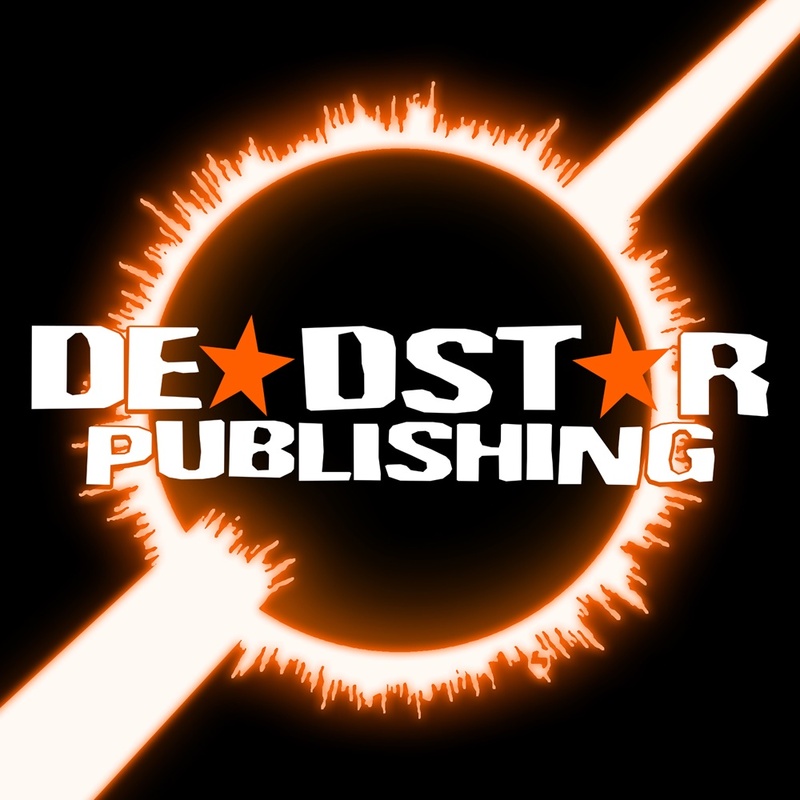 Eight years ago Deadstar Publishing was launched with the intention of showcasing new talent by publishing books, comics and graphic novels with a focus on horror, science fiction and fantasy. We wanted to help creators get noticed and started with Rising Stars volume 1 – alumni from which have gone on to make comics their full time career. Our current flagship titles are Dexter’s Half Dozen (nominated in 2014 for a Stan Lee True Believers Award) and our family friendly Dolphin Squad graphic novels. They believe that words and pictures matter, and they matter more when they are together. They believe that comics can make you laugh, cry, love, sing, sleep, weep, jump, fall, hunch, slouch, wave, dance, scream, hide and all points in between. They want Disconnected Press to showcase emerging talent in the UK comics world to people who read comics, and to people who don’t. 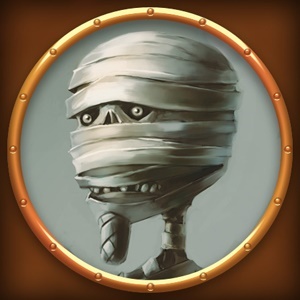 Dramascape create and sell maps for games, their PDF maps sell all over the world. Simon is also a freelance artist and has worked for companies such as Pinnacle (Savage Worlds), RedBrick Games, FASA and many others. Ellenstration showcases the work of artist Ellen, who loves to oil paint. She paints mostly in a Fantasy/Pop Surrealism style inspired by fairytales, mythology and magic. She sometimes sell her original paintings, along with prints, postcards and other goodies. 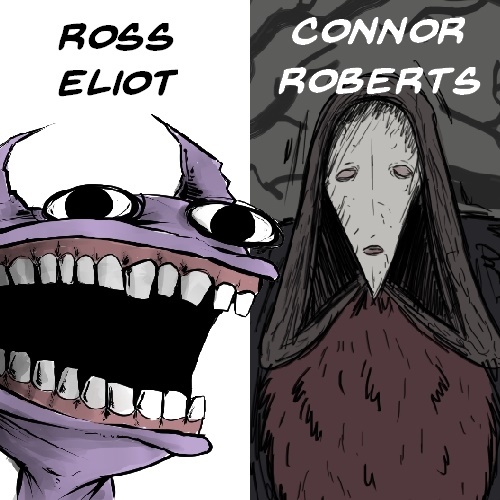 Ross Eliot and Connor Roberts are aspiring illustrators. They will be displaying and selling prints of their own art varying from fantasy illustrations to comic and manga fan art. Sarah Elliot is a former Swansea University Alumni returning for her second year at SCGC with her books and short stories, as well as her alpaca plush Mini Ace. Every Artist is a Cannibal showcases the work of artist and illustrator Huw Williams, who creates unique hand-drawn illustrations of famous characters from film and comics. 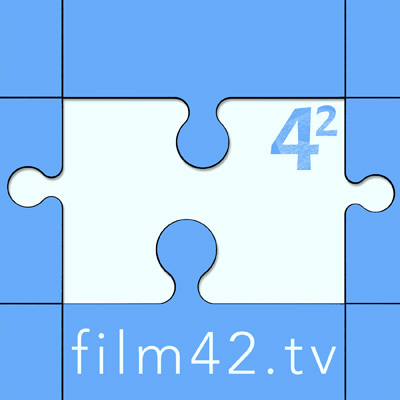 Film 42 Comics is a new comic creator, first publishing in 2016. “Myth of the K’inti” is a new series of comic books describing a vast new realm of creation and alternate realities, which reawaken a group of youngsters’ imaginations. 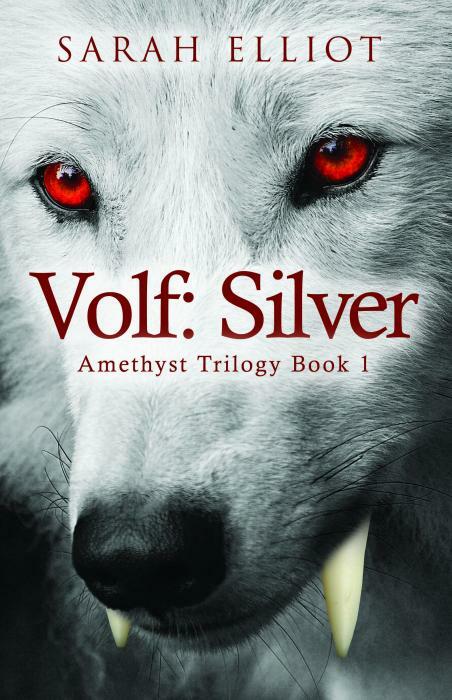 It chronicles the journey of Timo and his unusual companions. This is the first comic book collaboration of author Trev Burgess and Illustrator Dom Tsoi from South Wales, UK. Gear4Geeks is a one stop geek shop! Based in the UK they sell t-shirts, Funko Pops, Lego and cool geek merch featuring comic characters, movies, TV series, games and bands. 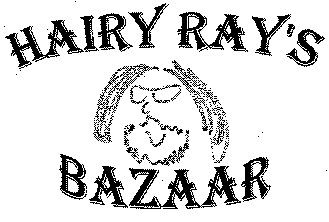 Hairy Ray Enterprises is your One Stop Shop for Books and Comics, all Pre-Loved but Great Condition. Some Collectables/Gaming Material Available Too! JadeJonesArt is a Swansea based, tea fuelled artist. Specialising in pop culture realism and tattoo style illustrations, her work is created using a variety of mediums and a whole lot of geekiness. 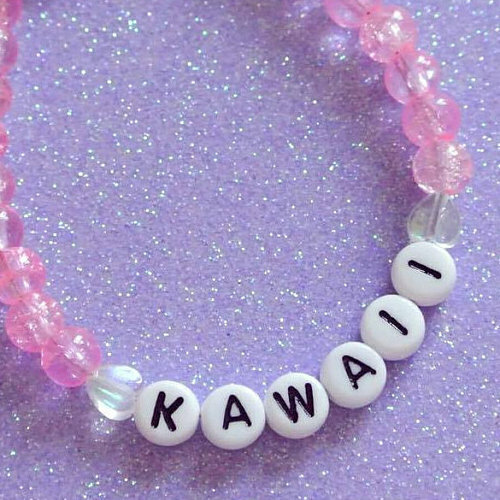 KawaiiOTP specialises in cute handmade jewellery and accessories based on favourite characters including bracelets, necklaces and keyrings. Kellercraft offers Hand made crochet figures, key rings and wearables based on a variety of pop-culture classics: Pokemon, Star Wars, Marvel, Mario, Harry Potter etc. Welcome to the Expanded Yarn Universe! Making Shtuff offers an assortment of crafts from nerdy to occult, selling creepy sketchbooks, wands and more. 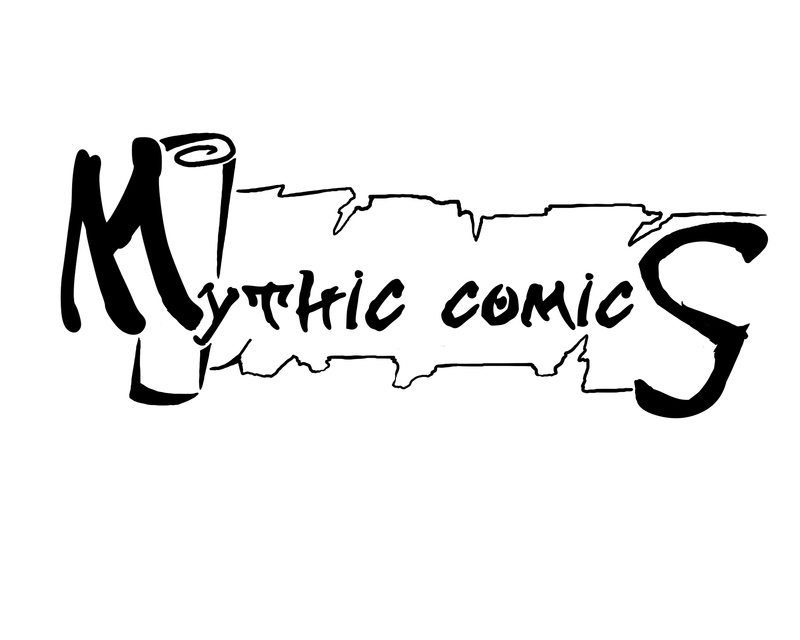 Mythic Comicsis a Swansea based aspiring digital artist and comic book writer selling pop culture art as prints, t-shirts and stickers. He will also be previewing his original comic, a retelling of ancient Greek mythology in a Modern dystopian world focussing on the stories of Herakles, Odysseus and Aeneas. Mythic Comics will also be joined at their stall by Eleri Angharad Illustrations. Gavin Mitchell and Emily B. Owen are a duo of self-published authors/artists. Gavin Mitchell (Santa Claus vs The Nazis, Steve Jackson’s The Trolltooth Wars, Samurai Slasher, The Pride) enjoys nothing more than to write lengthy, self aggrandising biographies. Emily B. Owen is the creator of Brain Shoodles, her debut solo comic book. 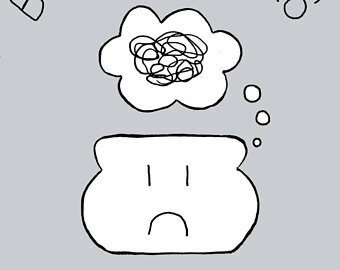 Brain Shoodles was published following a successful Kickstarter campaign and is an accessible and relatable autobiographical mental health zine. It’s aim is to hopefully make someone out there reading it feel less alone. 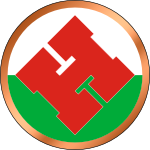 Swansea Hackspace will be displaying examples of projects, supplies and ‘stuff’ made and used at the hackspace and will be around to answer questions about who we are, what we do and how to join in. Origami Kate offers Origami decorations, novelties and favours. Peter James Maggs s an all ages comic creator. Peter creates comics to tell stories about the worlds that live within his head and give life to the characters that allow him to explore them. He fills most of his creative time making ‘the many strange cases of Ghost Jones’, an all ages supernatural detective webcomic about the unseen world of phantoms that hide underneath the small town of Gloomshire. Pontys Upcyclest/a> are a small, home based upcycling company. They take every day items and give them a comic book twist. They sell photo frames, mirrors tables and other home items. They also sell accessories such as keyrings and bracelets. They use every day comic, ranging from Avengers to Disney to make our items, so anything is possible but also everything is unique and different. 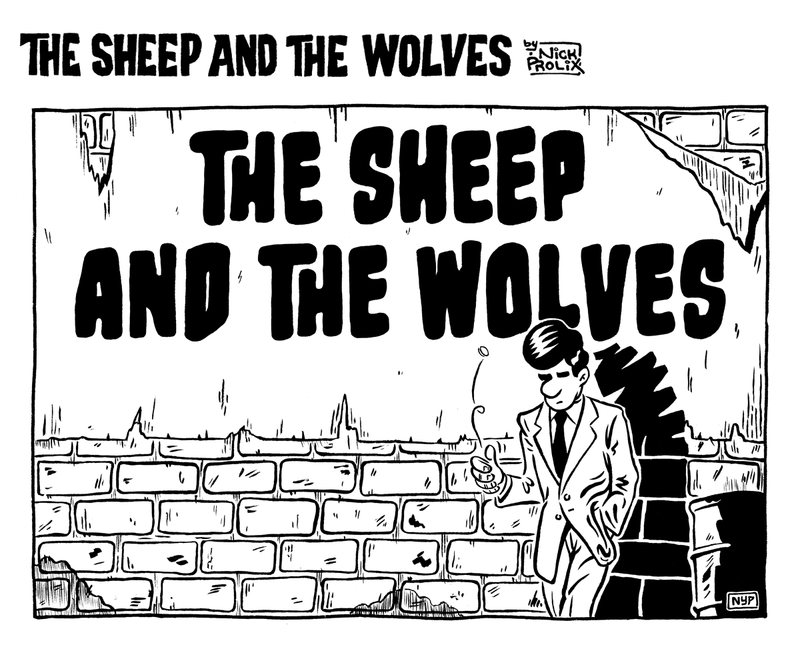 Nick Prolix is the cartoonist behind the one-person anthology series Nick Prolix’s Slang Pictorial in which he serialises a slice-of-life comedy drama set in 1960s London. 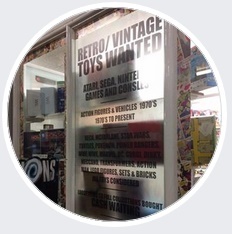 The Retro Stash are a friendly local independent family run business who specialise in retro games and consoles and also deal in Pokemon and Yu-Gi-Oh trading cards and various collectible figures. They buy and trade as well as sell so why not come and see what they have to offer. Little Dragon Designs make fantasy artwork and sculpture featuring dragons and other mythical creatures. 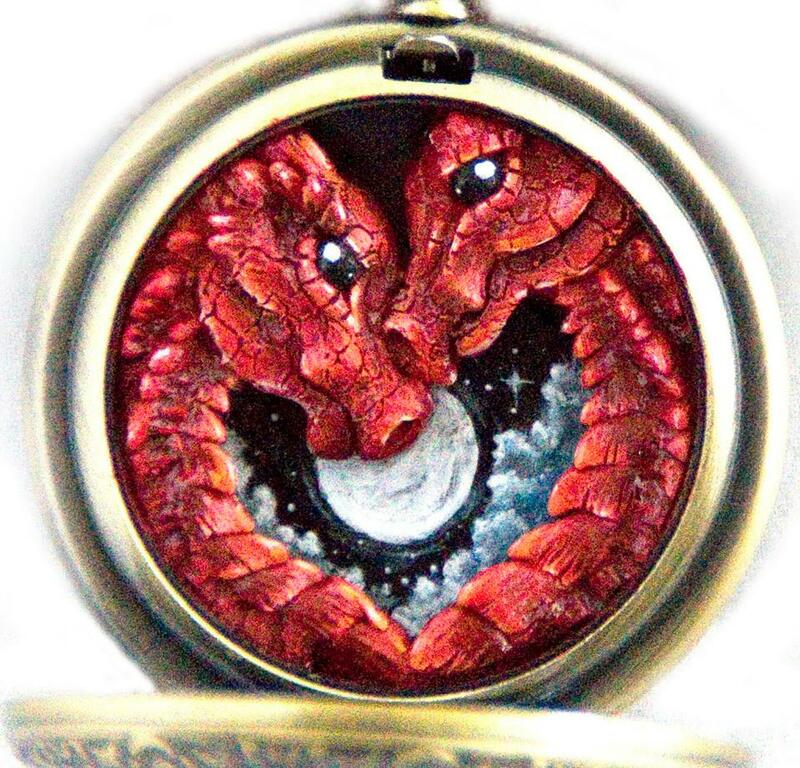 From their own range of fantasy pewter jewellery to handpainted agates and dragon sculptures to guard your dice, they have lots of unique things to interest fans of fantasy and dragons! 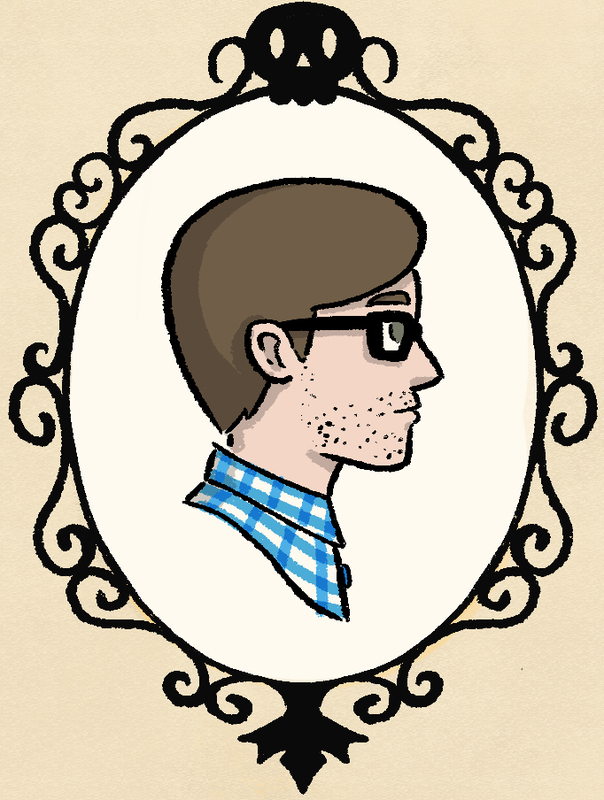 Owain Richards is an aspiring Illustrator based in the South Wales area. He will be selling a mix of Art Print, Original Art, Stickers, Postcards and on the day Sketch Commissions of your favourite characters. Real Tidy Design is proud to present its debut comic ‘The Zodiac Set and the Wondourous Exhibition’ , the adventures of a young Lady Green as she explores an alternate Steampunk version of the Great Exhibition. Can you find the hidden messages, revealed after breaking the concealed cyphers? Rocks Comics (formerly Cardiff Comics) offer Amazing Comic Books at Fantastic Prices! Room 207 Press is run by Howard Ingham,a writer and artist. His work has appeared in dozens of books, including over 40 titles for White Wolf Games Studio, and the upcoming Modern AGE for Green Ronin. He’s bringing his games and fiction to SCGC once more. 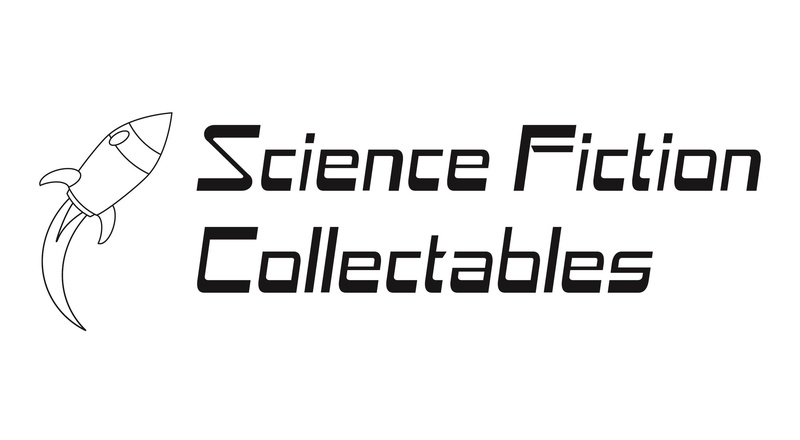 Science Fiction Collectables is Bridgend’s independent toy and gift retailer. 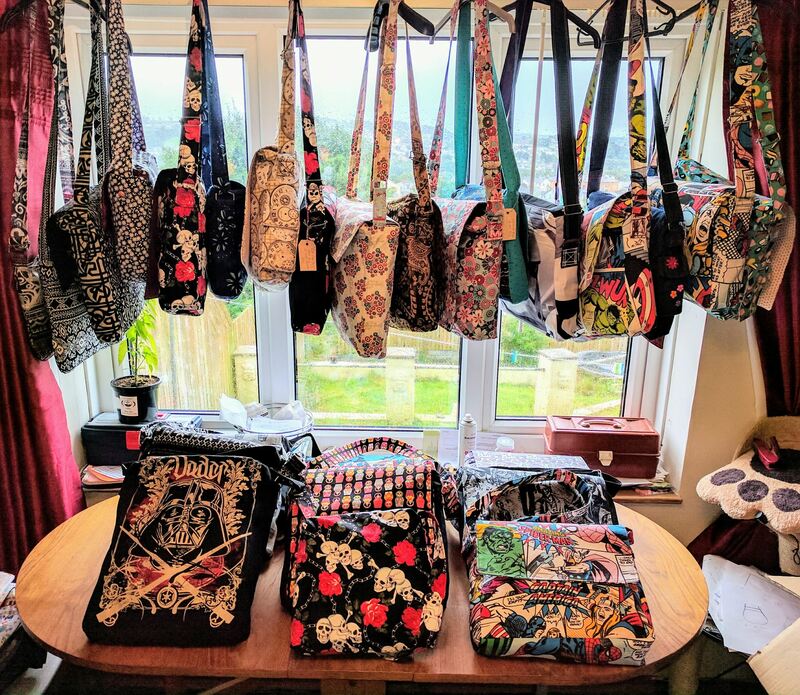 Specialising in entertainment brands, most of their products are unique in the area and they can frequently be found bringing their distinctive range to collector events throughout South Wales and the South West. The Shabby Artist is a Swansea based artist specialising in film and TV fan art, particularly The Walking Dead, American Horror Story and Rob Zombie although her range is constantly expanding. 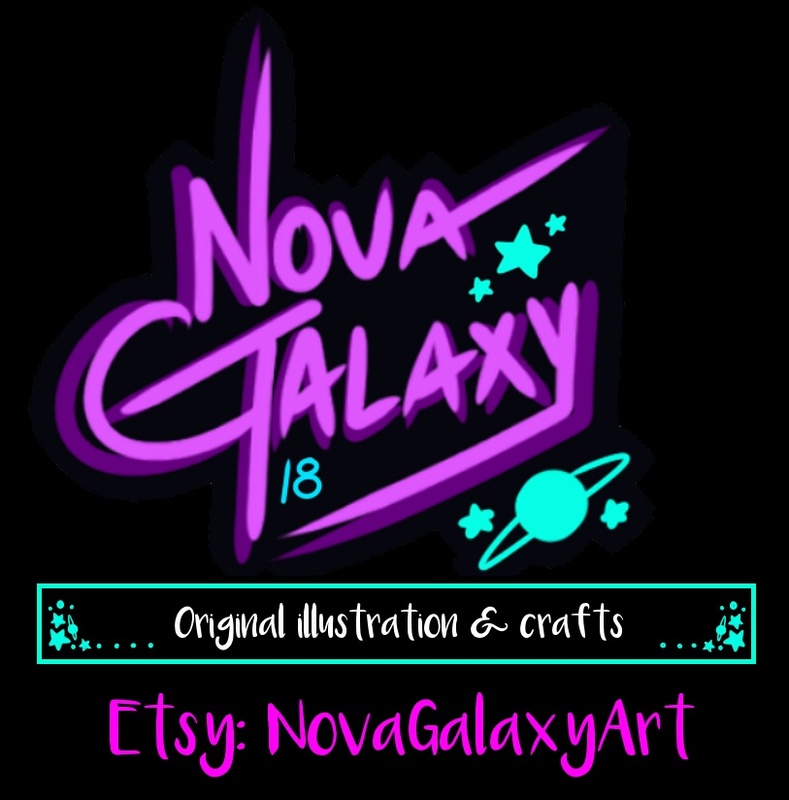 She makes art prints, art cards, bags, badges and geek inspired greetings cards. She also makes sewn items such as cushions, clothing and horror/character rag dolls – all with a TV/film character theme. You will also be able to request custom orders for some items at the event or pick up orders by previous arrangement. 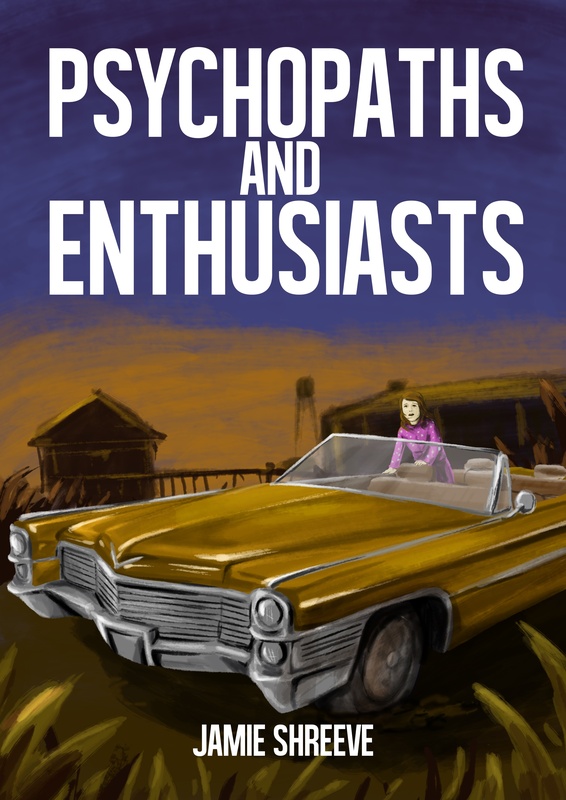 Jamie Shreeve is the Swansea based author of “Psychopaths and Enthusiasts”, a debut novella that follows four individuals whose paths intertwine following the kidnapping of a little girl from her home on Christmas Eve. The story unfolds when a man finds himself in a room with two dead bodies, a girl tied to a chair, and no memory. He must find a way to figure out how he got into this situation, and how to get himself out of it. With the interference from a questionable detective, a woman with a samurai sword and an axe wielding psychiatric patient, this quest will be anything but straightforward. What will happen when these strange characters collide? The frayed and fractured hands of fate will eventually decide who sees it into the New Year. 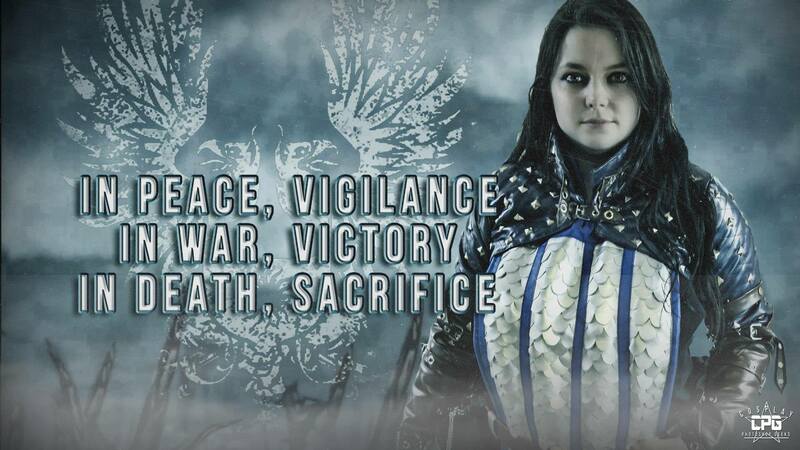 Stagman Creations aim to create individual and unique items for steampunk, historical re-enactments, pagan, live role play, retro and alternative scenes/events. 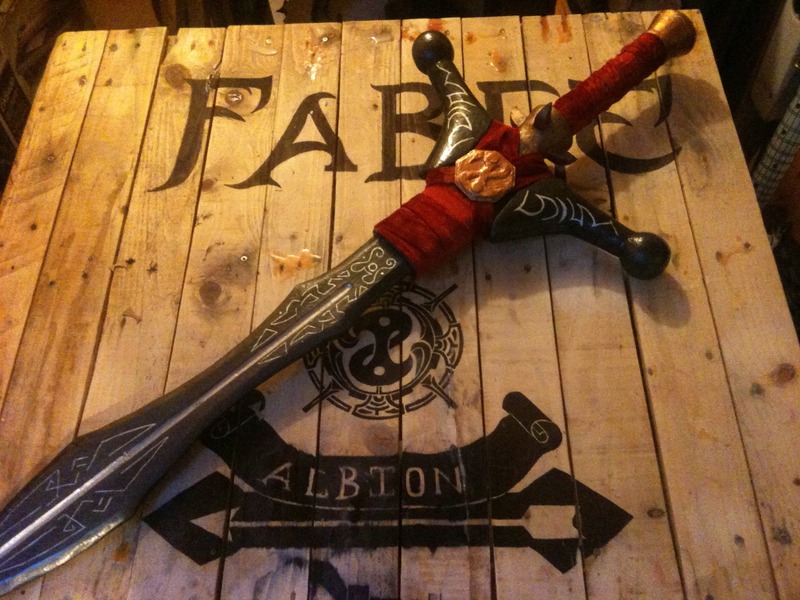 They also specialise in props and accessories for theatre and television as well as gifts. Timbo Johnson Weird and Wonderful, Cute and Strange, all kinds of designs all in sticker and badge form! Waterstones are situated in Swansea city centre,their shop sits in a multi-storey Grade II listed building, formerly the first purpose-built cinema in the country. Theye sell a large selection of graphic novels, manga and trading cards. Yewtimber are a small home-based trader who works in exotic and hard woods incorporating other materials. Their work incorporates traditional, steampunk and comic related themes to creat items such as lamps, tea-lights, bandsaw boxes, sculptures and much more.